Drive your own boat on an organised tour around Sydney Harbour and get close-up views of all the major highlights in Sydney Harbour! Drive your own boat on an organised tour around Sydney Harbour and get close-up views of the main highlights in Sydney Harbour! Do you like adventure? 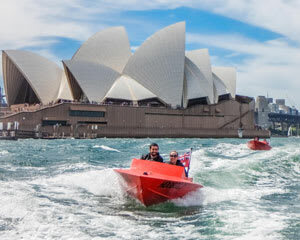 If you are tired of joining the usual tourist crowd then you should book this intense and very personal way to enjoy the major highlights of Sydney Harbour in your own boat. On our tour you will discover the major highlights within 75 minutes. Drive below the Harbour Bridge, next to Sydney Opera House and glimpse up-scale residential properties from their backyard. No license or boating experience is required. Before the start of the tour we will provide a boat safety and operations briefing. Once training is completed you will be able to operate your own boat as you follow our experienced and knowledgeable guide through Sydney Harbour for the 2-hour adventure. Our custom-built boats can accommodate two people each and due to their special design will offer you a completely different viewpoint on the water compared to large sightseeing vessels. This will enable you to get a much more intense boating experience. Our group sizes are limited to 6 people only to allow for a very intimate trip. Your guide will lead you to the best spots and assist you on the water. Minimum age to rent is 18 years and minimum participant age is 10 years (please note that we only require renter's details at checkout, not participant). We provide ponchos but most guest enjoy the occasional refreshment from sea spray! The total experience takes about 2.5 hours, with 75 minutes driving on the water. I purchased the self drive boat adventure as a birthday gift for my best friend. It was absolutely worth the money, my friend and myself had a fantastic time driving around Sydney Harbour. The staff were friendly and knowledgable and I would recommend this adventure to anyone. I can strongly recommend this activity for anyone wanting to see Sydney Harbour from a different perspective. The activity was fun, the boat simple to drive and the owner and his colleague friendly and forthcoming.